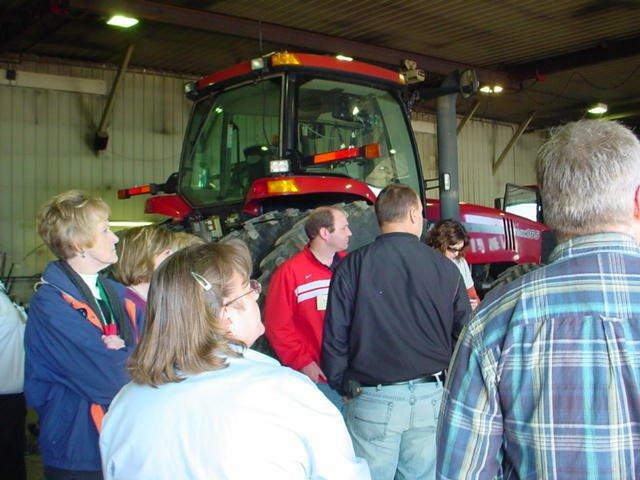 Agriculture session on March 15, 2011.
on the Farm Program and agriculture lending and issues facing agriculture today. The members traveled to Milligan where Kelly Baller took them on a tour of Milligan House of Meats. The group walked to Ron’s Tavern where B & A Farms provided kolaches. During the break Jeff Janksy spoke to the group about the many entrepreneur projects he is involved with from chickens to manure spreading to raising hogs. The members traveled to Milligan Pork north of Milligan where Jeff Jansy spoke to the group about the hog finisher and how it is managed. Next the group traveled to Harre Feedyards where Katherine and Robert Harre gave the group a tour and talked about the workings of a feedlot. The members enjoyed the lunch sponsored by PC Nuts at John E’s in Exeter. Allen Vavra was the speaker at the Farmer’s Cooperative in Exeter. He talked about the crop production in Fillmore County and the surrounding area that come into the Farmer’s Cooperative and to what places and foreign countries the grains are shipped. Vavra stated that 5% of the white corn raised in the United States goes through Exeter. The next stop was Manning Grain in Burress where Kent Manning spoke to the members about the 1940’s dance hall and the amount of grains that are hauled into the storage there. The group also boarded the Manning Grain locomotive located on the railroad tracts there. Advanced BioEnergy provided a snack while Tony Beam shared a power point about how an ethanol plant works. Then Megan Williams took the members on a tour of the plant. Traveling back to Geneva, Bonnie Zelenka and Jim Engle talked Geneva Implement and computerized tractors, combines and other implements. Several members of the group drove a new tractor. The April session of the Odegeo. . . Leadership for Fillmore County will focus on Business and Industry.